Devi Ahilya Vishwavidyalaya offers various courses in UG & PG courses like BA, BSc, BEd, BCA, BBA, BPEd, BCom, MCom, MBA, MCA, MEd, MSc, ME, MBBS, BUMS, BAMS & BDS. 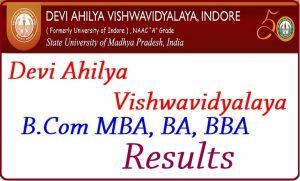 Devi Ahilya Vishwavidyalaya has released the results for B.COM. SEM-3, M.B.A (BE) SEM-3, B.A.PART 2 SEM-3, M.B.A (APRM) SEM-I, & SEM-III, B.B.A. (FOREIGN TRADE) SEM-5. All the candidates appear for these exams can check their results from from the link provided below or from the official website. Large number of candidates appeared for the exams every year. All those candidates eagerly waiting for to check the results can check the results in two ways. Your search your results by Roll no or by Name. Here we have provided the steps to check the results. Visit the official website or open the links given below. Results for all different branches appear. Click on the relevant link of your. Devi Ahilya Vishwavidyalaya students appeared for the exams can check the results from the above provided links. All the best for all the students.